HOW DOES OUR TRADITIONAL CONSIGNMENT WORK? There is "No Appointment Necessary". There is no limit as to how much you can "Drop-Off"
per week, per consignor, due to limited storage space. Items must be brought in "READY TO SELL" condition. (Like new or nicely used). Non-Clothing should be clean and complete with all pieces. which will go on an account for you. "Pay-outs" are on "3rd Full Week" any month;$100 max,$15 min. you use it or pick it up. See our Consignment Agreement, in store, for more details. Seasonal Limitations do apply. See chart below. Car Seats over 5yrs old, due to safety requirements. Seasonal Chart to your left. 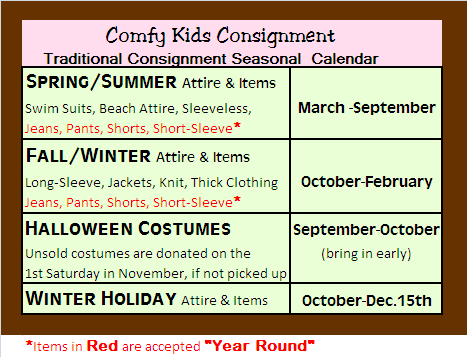 DO NOT accept for Traditional Consignment? these inexpensive labels have no resale value.